The organizational committee of the EAA Joint Symposium on Auralization and Ambisonics 2014 invites all scholars interested in topics of virtual acoustics to come to the vibrant and vital city of Berlin. Today, Berlin is an intercultural melting pot owing a vast cultural, scientific, administrative and economic life. What's more, Berlin is enclosed by a beautiful country side and it has even more bridges than Venice! 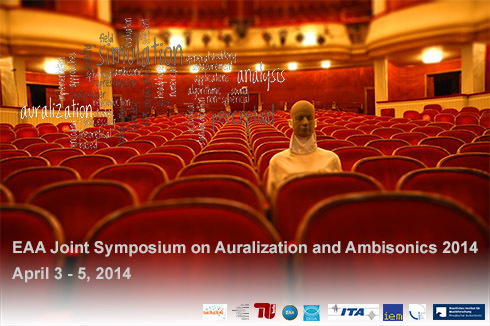 The symposium will integrate the 2nd International Auralization Symposium, and the 5th International Symposium on Ambisonics and Spherical Acoustics. The symposium will be hosted by the Audio Communication Group/TU Berlin in cooperation with the Federal Institute for Music Research (SIMPK) and the SEACEN Consortium for the Simulation and Evaluation of Acoustic Environments. The event will feature three days of keynotes, talks and posters conducted as a single stream conference. It will be held in rooms of the SIMPK, an inspiring venue designed by the office of architect Hans Sharoun who also designed the famous Berlin Philharmony. The SIMPK also features the Musical Instrument Museum of Berlin owing one of the largests collections of musical instruments in Germany.